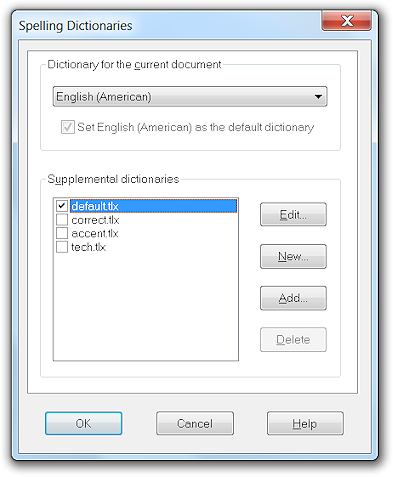 The Spelling Dictionaries window allows configuration of the language and supplemental spell check dictionaries. Choose the desired spell check dictionary based on the language of the currently active document. The dictionary language choice you make is specific to the current document, although the Set ... as the default dictionary check box can be used to make your choice the default spell check dictionary language for all new documents. The dictionary language choice is saved as part of the document. Jarte comes with English (American, British, and Canadian), Spanish, French, Dutch, German, Italian, Portuguese (Brazilian) dictionaries. If you do not see all of those choices available then reinstall Jarte and be sure to select the desired dictionaries during the installation steps. It is possible to simultaneously use more than one language dictionary by adding them as supplemental dictionaries. See Second Language Dictionary further below. Dictionaries for other languages can be purchased at Wintertree Software. Additional primary dictionaries must be placed in Jarte's "Spell" program folder (e.g., C:\Program Files\Jarte\Spell). You can also import additional language dictionaries or word lists of type DIC or TLX into Jarte as supplemental spelling dictionaries as described below. In this case, it may be desirable to set the primary spelling dictionary to a value of None so that only the supplemental dictionaries are used. Spell check uses a primary dictionary and any selected supplemental dictionaries to determine whether a word is correctly spelled. The check box next to each supplemental dictionary determines whether the dictionary is used by the spell check feature. There are four standard supplemental dictionaries. Additional custom dictionaries can be added. The following dictionaries are the standard supplemental spell check dictionaries. These dictionaries can not be deleted (although unchecking them will prevent them from being used by spell check), and, except for default.tlx, the standard dictionaries can not be modified. default.tlx - This is the default custom spell check dictionary. It is the dictionary to which words are added when using spell check's Add function. correct.tlx - This dictionary is used by the Auto Correct feature. It associates common misspellings and their corresponding correct spellings. accent.tlx - This dictionary contains many accented words, such as "attaché", which would normally be flagged as misspellings. Include this dictionary if do not want commonly accented words to be flagged as misspellings. tech.tlx - This dictionary contains a number of common technical terms or names (mostly computer and Internet related), such as "Bluetooth", that would normally be flagged as misspellings. Include this dictionary when writing a technical document if you want to reduce the number of technical words flagged as misspellings. You can create new custom spell check dictionaries as well as add existing dictionaries. Click the New button and enter a dictionary name to add a new, empty dictionary to the supplementary dictionary list. Existing TLX and DIC dictionary files can be added to the supplementary dictionary list by clicking the Add button and selecting the desired dictionary. Dictionary files can also be added to Jarte simply by dragging and dropping them on to the Jarte program window. Jarte will make its own copy of the dropped dictionary file. Press the Shift key while dropping the dictionary file if you want Jarte to link directly to the dictionary rather than making its own copy. Microsoft Word custom spell check dictionary files are implemented as DIC files. If you have created a custom spell check dictionary in Word then the dictionary can be added to Jarte as described above. Custom dictionaries can be deleted from the list using the Delete button. Note that the Delete button does not delete the dictionary file itself, it only removes the dictionary from the Supplemental Dictionaries list. Deleted dictionaries can be added again using the Add button. In most cases, it is sufficient to simply uncheck a dictionary in the dictionary list rather than delete it. See Editing Custom Dictionaries for information on adding, removing, and modifying entries in a custom spell check dictionary. A second language spelling dictionary can be added as a supplemental dictionary. For example, if you primarily write English documents, but often write in Spanish as well, then you might want to add the Spanish spell check dictionary as a supplemental dictionary. This will ensure your words are spell checked against both the English and Spanish dictionaries. Copyright © 2001-2017 Carolina Road Software L.L.C. All rights reserved.